Create your own custom and unique personalized cheese board gift for your friends and family this Christmas! Who doesn’t love cheese? Anyone on your Christmas list would be lucky to receive this personalized and customized DeLallo Build Your Own Cheese Board Extravaganza Gift Collection. The customization factor makes this gift truly unique, as it can be created with your foodie and cheese lover friends’ favorites in mind. You can keep it simple with six items, or you can go big and select twelve items. Either way, whomever you gift this cheese board to will love it! With the six item option, you will be able to select two cheeses, two meats, and two accompaniments. 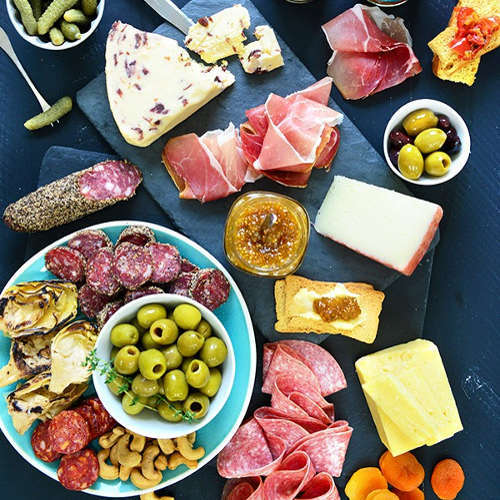 With the bigger option of twelve items, you will get to choose four cheeses, four meats, and four accompaniments. Ranging from the elegant simplicity of a versatile domestic Swiss to the exquisitely extravagant flair of a merlot BellaVitano, this selection of cheeses enables you to pick the perfect ones to fit your loved ones’ preferences and palates, making this a wonderful and unique Christmas gift!